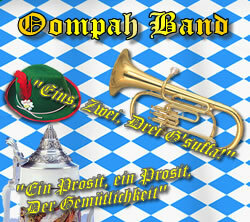 Top Class Bavarian Oompah Band. Available from Solo entertainer through to 8 piece band. The band is usually 3 or 4 piece as standard but can be provided as a solo front man, self contained with Accordion and Vocals. The band can also take the form of up to 8 musicians including frontman. The band can play Bavarian music and Pop music in Bavarian style. Includes all the usual bier Kellar tunes for drinking. Experience: All types of venues and occasion have been catered for. Corporate and private functions, Military events etc.